This was a narrative piece created utilising Unity Assets combined with basic Greyboxing techniques. The end goal was to create a story in which players are able to grasp the world they are in just from the Environmental Story telling. It helped me to grow my level design and planning techniques along with some practice with set dressing. The goal of this concept was to create a bunch of scripts that were quite modular and so could be utilised across a bunch of different robots. Each of the scripts were to function without any inputs being connected into them and be able to be tweaked entirely by variables in order to get the necessary effect. These are a collection of Grey-boxes that were created based on various pieces of concept art. 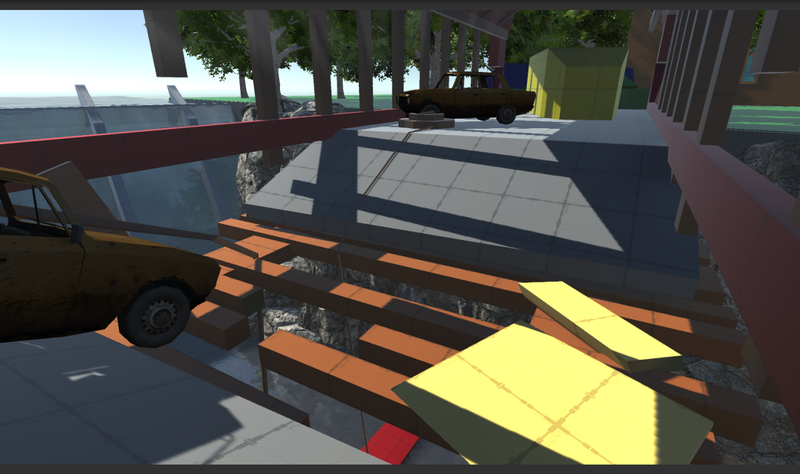 The exercise was used to increase my abilities with Probuilder as well as general Level Design skills. The recreation of Concept Art was an extremely good challenge in having to turn something that isn't necessarily drawn to scale into a playable space for a character controller. ​This AR Concept was made with the goal of exploring new technologies and the limits that designing for them presents. This game revolved around two players placing a card which the game with the help of Vuforia was able to pick up and assign a score value. Once both players had assigned their card they would then press the begin button and the higher card would win. Overall the game let me explore these new interesting technologies while also learning the restraints that come with Augmented Reality at its current state. Plumbing Posse was a 3 Day Game Jam Game created at AIE in order to further our abilities to work within teams. The game revolved around a simple mechanic of repair with the right tool. It was some really good experience working in hastily preprared teams. Utilising Unity's reflective function I wanted to create a small game that could use it in conjunction with a USB-Joystick I had around the house. The end result was a fun little game in which you attempted to protect your crystal from being destroyed by enemy attacks. Despite the reflection being an exact bounce it didn't initially feel correct and so some randomness was added to the reflection Vector along with simple particles to add to the feeling of the collision. 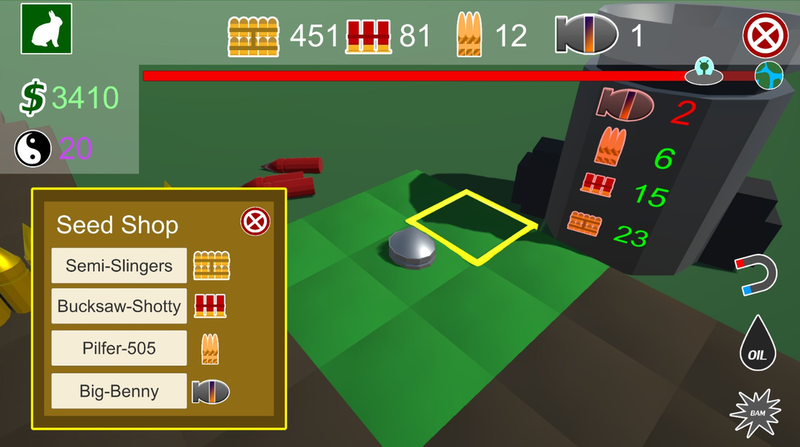 Explosive Jumping was an exploration into the uses of Force within Unity. 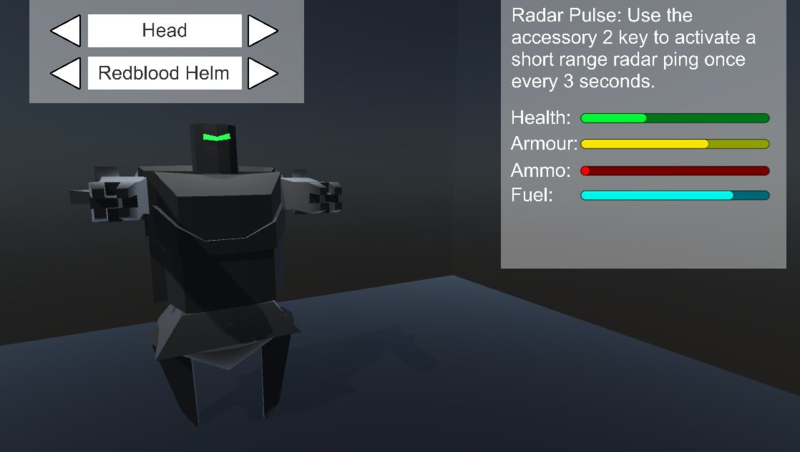 Combined with a simple shooter that changed your stats based on the armour you equipped. Despite the initial testing going smoothly I soon realised that the use of force was not precise enough for the effect I was looking for. If I was to redo this I'd make sure the ground terrain pieces were a much smaller size and use a radius to decrease the height of the terrain the further it was from the centre. Elemental Brawlers was a concept pitch for the final year end of project. At the end of the day the scope was too large to qualify but it was to be a small scale fighting game. Players would have to utilise their fighters and the environment in order to overcome their opponents, the game revolved around 4 Characters each with their own distinct element that would affect the environment in different ways and would help lead to their win. Bullet Farmer was one of the concepts that reached closest to a complete game, it was a look into economies within game environments and how they can be balanced in order to keep players engaged. There were also a large sum of good lessons learnt in regards to UI throughout the development. The concept of Networked Multiplayer has always interested me and so I took some time following some rather large tutorials in order to get a better understanding of multiplayer systems, along with a simple quest system that could be attached. The Beatsmith was a dive into android development, the problems and opportunities that it brought about. Along with the difficulties presented by non-procedural tile placement within rhythm games. The Animal Kingdom was a look at ways in which game systems could run in the background in order to enhance a world and make it feel more lived in. The tigers would go about their lives and when hungry hunt down chicken spheres before continuing to stroll within their designated zone. The use of this within large open world games would be to add an interesting ecosystem running in the background of the world as the animals fight to eat, breed and survive. These are a combination of concepts that would work within a Mech style of game. They range from exploration into weapon systems, armour systems and even an attempt at making a joystick controlled sword that would apply damage based on it's angle, speed and hit location.